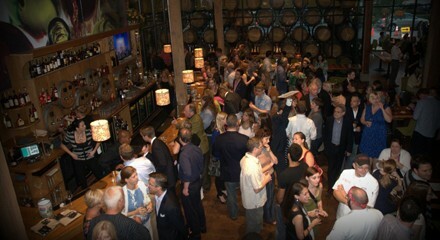 When City Winery's Chicago location opened in August in the West Loop (the original is in New York), early reports of terrible service and lackluster food suggested that the restaurant/music venue/winery needed some time to get its legs under it. Three months in, the service seems to have improved—though the fact that the place was more than half empty on a recent Sunday evening may have helped—but the food is still nothing to write home about. The good part: the cavernous space is lovely, with lots of wood and exposed brick. Barrels of wine behind glass constitute part of one wall and empty wine bottles decorate another; lamps, candles, and a fireplace make the place feel almost cozy despite its size. The wine—made on-site—was good too, but not cheap at $11-$15 a glass. Still, I enjoyed the spicy, fruity zinfandel and an earthy, peppery cabernet sauvignon. Our waitress recommended the salumi flatbread (crispy and sparingly topped with red peppers and thinly shaved salami) and the funghi rice balls—which were a little bland but could have been saved by the black pepper-cream sauce if the latter had had any discernible pepper in it. If the meal had continued at that fine-but-not-great level we would have left relatively happy (though still feeling we'd paid a little too much for what we got, I suspect). But the flank steak in our steak frites entree was so tough it was impossible to eat while talking, each bite requiring a minute or so to get down. The flavor of the underseasoned piece of meat did nothing to make up for the texture, though the chimichurri sauce served with it helped a little. And, City Winery, if you're going to serve meat that's impossible to cut without a steak knife, it would be nice if you supplied steak knives instead of butter knives with it.